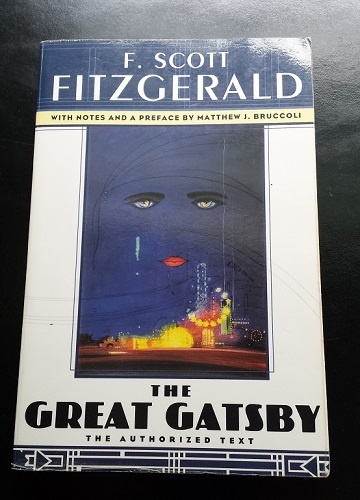 My well-worn copy of The Great Gatsby. While I am far from alone in saying so, The Great Gatsby is my favorite book. It has been since Mrs. Smith’s 10th grade English Lit class back at good old Downers Grove North High School. It’s the reason I’m (trying to be) a writer and it’s turning 90 today. Happy birthday, James Gatz. Like many before me, The Great Gatsby is responsible for my desire to chase the dream of being a writer. I wrote long before being introduced to it, but it wasn’t until I read it that I found out you could do THAT with language. Absolutely beautiful, each sentence a treasure. It has been intertwined in my life ever since. The first thing it brings up is memories of Mrs. Smith’s class. The whole room was done in a series of reds, browns and oranges. Everyday before class I tried to talk to Jody, a pretty girl with long blond hair. She sat in the front row, I two seats behind. Between us sat one of the guys from the wrestling team. A huge, hulking mass (not unlike Tom), enjoyed tormenting me, including throwing me over his shoulder and spinning me around. Jody always stood up for me and told him to leave me alone. Her and I never got close, never hung out outside of school, but I treasured those few minutes talking with her every day. Some years later I was watching the WGN news before going to work and they reported the body of a young girl was found, naked behind a dumpster. Jody was dead and details were hazy. She was the first person my own age I had known to die. She dances through my mind every time I read The Great Gatsby. And I read it every year. (I think I missed one year in there maybe not – a lot of those years were lost in drink). As Chicago winter turned to Spring I pulled out my copy, which I purchased at an overstock store that was next to my first job at T.J. Maxx when I was 16. I worked there with my father and my best friend, and I think of them too when I open the cover. Reading those first pages of Gatsby meant winter was over and beautiful things were to come. Even when I wasn’t reading it I’d carry it around like a talisman. Exactly why I can’t say. It felt better having it on my person. Before it was Gatsby I’d carry Peter Pan wherever I went. When I fell madly for another lovely blonde girl, I gave her a copy of it for Christmas. She read it in the span of a few days (a day?) and then told me I reminded her of Nick. When I read it it reminds me of her. She’s still the only one who has captivated me on all levels. It led me to Fitzgerald’s other fiction, which I couldn’t get enough of. It led me to my love with 1920s literature and culture. It led me to have a gin rickey at the bar he frequented in Baltimore after I hadn’t drank for a year and a half. It led me to his grave in Rockville, Maryland on the last night I spent in D.C. Every life has a few great influences and this book is one of mine. I don’t know where I’d be or what I’d be doing if it hadn’t crossed my path.